You probably won’t be thinking about nose hair scissors when you have no problem with long and protruding nose hair. Some people are lucky enough not to have long hair all over the body, including on the nose – which can be a bit embarrassing. Some, however, are left with this issue, leading to them finding the best solution to deal with the issue. Scissors are considered the best solution that delivers fast result without causing pain or probably injury – although you have to dedicate your time to do the cut several days within a week. When compared to waxing (yes, it is possible to wax your nose), scissors are less painful. And the fact that scissors don’t really yank or pull the hair from the root will lead to the fact that this method is less obtrusive. And you will have less possibility of dealing with ingrown nose hair issue – which can be annoying and more painful. Using the shaver may be more convenient but the contour of the nose itself is quite difficult to run smoothly and effectively. That’s why the scissors are considered the most ideal method to cut, trim or get rid of the nose hair. It is easy to use and it won’t cause any pain at all. Not to mention that you cut the hair at a certain length, preventing the possibility of the ingrown hair problem. Now that you know that the scissors are the most ideal item to trim the nose hair, it is time to narrow down your options. It may be surprising for you to know that there is actually abundance of products for the nose hair trimmers. Narrowing down your options can be quite difficult and complicated. So, what are the elements you should consider when choosing a product? The multifunctional scissors. 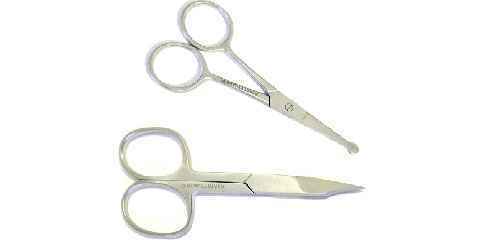 There are some multifunctional scissors that can be used to trim the eyebrows, moustaches, nose and even ear hair. Having this kind of multifunctional item can be handy because you don’t need to buy many types of scissors to trim the facial and also body hair. The safety features. You don’t want to pick any kind of scissors, especially the ones with sharp edges. Some nose scissors are having rounded edges so it won’t prick your nose – and it is definitely safer. The sharpness. Some scissors are sharp while the others are slightly dull. You want to choose the one with easy and nice sharpness. The portability and size. Some scissors, surprisingly, can be quite big. Some, however, are pretty small and portable. They even have their own case so you can carry it around safely. These are the basic requirements that you need to consider when choosing a scissor for the nose. Consider additional features, such as electric scissors, or rotary blade, or such thing alike. Some scissors are pretty sophisticated with very easy to use features. But then again, such an item can be quite costly. In the end, be sure to choose carefully when you want to buy the ideal scissors for nose hair that suit your needs.